​VillageMED was pleased to field for the first time a medical team comprised completely of Haitian medical professionals for its Winter 2017 Medical Mission. 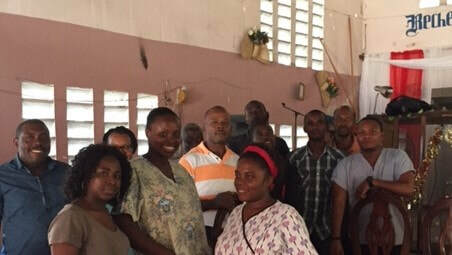 ​Working with Haitian Americans from its Haiti’s Healthy Child Project Advisory Board, VillageMED was able to recruit and dispatch physicians, nurses and volunteers from Haiti to treat our patients in Carrefour. During the holiday season, VillageMED delivered needed pediatric care to children living in our service area in Carrefour. The generosity of the Washington DC Chapter of the Links, Inc., allowed us to distribute hundreds of toiletry care packets to parents and children during our mobile pediatric clinic. A critical grant from the Institute for Technology in Healthcare (ITHC) allowed VillageMED during this clinic to begin Phase One of our mHealth Care Initiative. In capturing the mobile telephone numbers of patients, VillageMED will be able to strengthen its clinic work by integrating mHealth (mobile health) services and systems into its medical culture. VillageMED’s medical team was warmly greeted by the delightful children of Carrefour and their parents. Vital medicine provided by Map International was dispensed following their comprehensive physicals. ​Additionally, VillageMED sent each child away with a holiday gift bag full of treats and surprises. VillageMED had the opportunity to visit the mountain town of Layaye, a rural community where the children receive minimal or no medical care. ​Plans are underway to wrap its community of children in quality pediatric healthcare during VillageMED’s Spring 2018 medical mission to Haiti.